A week back when I was looking out for a pair of regular-fit jeans in a popular online store, a flashy banner promising high discounts on mobile phone camera accessories grabbed my attention. After delving into the details I purchased a couple of items. 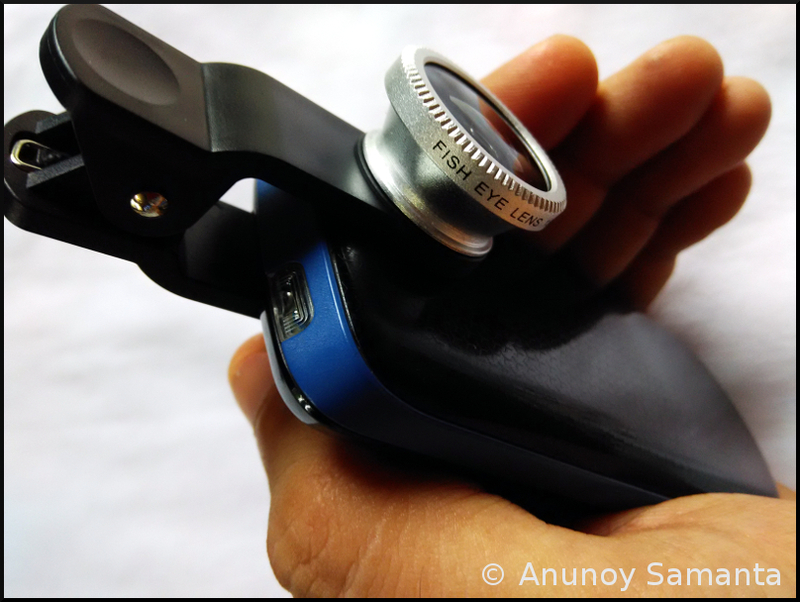 I've reviewed both of them separately and today's review on board is of Universal 3 in 1 Cell Phone Camera Lens Kit from Fotonica. 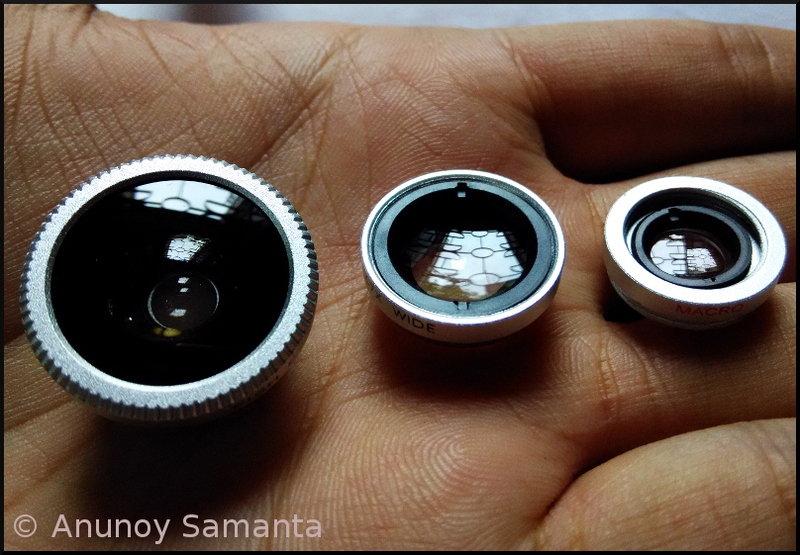 Fotonica is offering this lens kit at a negligible price point of 350-550 INR (depending on stores) and claiming that these compact lenses in one kit shall give you an array of shooting options for enhanced mobile photography. The manufacturer boasts of the universal design and high quality of its lens material. After a thorough testing of this lens kit with my Xiaomi Redmi 1S and Nokia X2 I am ready with my verdict on how far Fotonica has succeeded in keeping its promise. The Good: Dirt cheap price, Portability and the Macro lens. The Bad: Fitting issues with many mobile phone models, Occasional lack of focusing with fish-eye/wide-angle lenses, Lack of details in the image, Prominent vignetting and distortion. Three lenses in one kit- The Fisheye, Wide angle and Macro Lenses. On paper, Fotonica's lens kit is compatible with smart phones, iPhone, iPad, iPod, Android tablets, Tablet PC, Laptops and so on. Those tiny lenses bordered with aluminum mount looks cute over the palm but let's see how helpful they really turn out to be when it comes to mobile photography. Is spending 500 bucks on this kit justified? Does it add something extra to your mobile clicking experience? Well, read this concise review of Fotonica Cell Phone Camera Lens Kit with test shots to find it out whether you should wish-list it, or simply give it a pass. Coaker's Walk is a kilometer long pedestrian path constructed along steep mountain slopes on the southern side of Kodai road located in the popular hill station of Kodaikanal (Tamil Nadu). If the weather is on your side you'll be amazed by the picturesque vista of the valley below. Like we find uncountable wheeler-stalls of fast food in Bengal, fruit selling stalls are similarly in abundance throughout the Nilgiris. Surprisingly a lot of those fruit sellers are young people, either boys or girls who're few years yet to reach 18. Well, I'm really confused whether to be sad or glad about it. My idealist says, it's nothing but a form of child labor but, my rationalist says, what's bad in getting self empowered at early age? Somehow I feel these fruit-seller boys in Coaker's Walk support my rationalist's view and give a damn to what the idealist thinks! In next photo post I'll be introducing you with the third terracotta temple of Kalna. Do visit back folks. Natamandapa in front of the Lalji Temple. A bike (motorcycle) trip was long due and what could be better than a monsoon day when you are never sure when it starts drizzling. Being only about sixty kilometers away from my hometown, I had been to Kalna before and had visited its much renowned terracotta temple complex along with 108 Shiva Temples. Apart from a short ride my craving for clicking photos was on its peak too. After a heavy homely lunch, the only feasible destination I could think of was Kalna. The road wasn't quite merciful, so was the weather. On reaching Kalna, without wasting a single minute I directly headed to the terracotta temple complex. Five O' clock meant afternoon was already over. The falling daylight and whimsical sky weren't in favor of this amateur shutterbug. Well, the second temple I visited was the Lalji Temple, the oldest in the group, erected in 1739 AD enclosed in a compound. Many terracotta figures have worn off yet there are lot left for you to see and appreciate! Other than ruthless time, indifference from Archaeological Survey of India and thin carpet of mosses have taken their toll on the rich terracotta ornamentation over Lalji Temple. The presiding deity of Lalji temple is Lord Krishna. This brick-built temple has twenty-five peaks on its roof and this pattern of temple architecture is termed as 'Panchavimsati-Ratna'. There is a Natamandapa and another mountain-shaped temple called Girigovardhana Temple in front of the Lalji temple enclosed in the same boundary walls. The facades of the temple are also decorated with beautiful terracotta art. Although many terracotta figures have worn off yet there are lot left for you to see and appreciate! If you're visiting the town of Kalna or any nearby place, a visit to Lalji Temple should be in your 'must do' list. Please visit back when I return with photos of other terracotta temples of Kalna. Girigovardhana Temple in front of the Lalji temple. Do visit back soon to check out photographs of a three-hundred years old temple from Kalna (West Bengal). Till then take care folks and have good time! 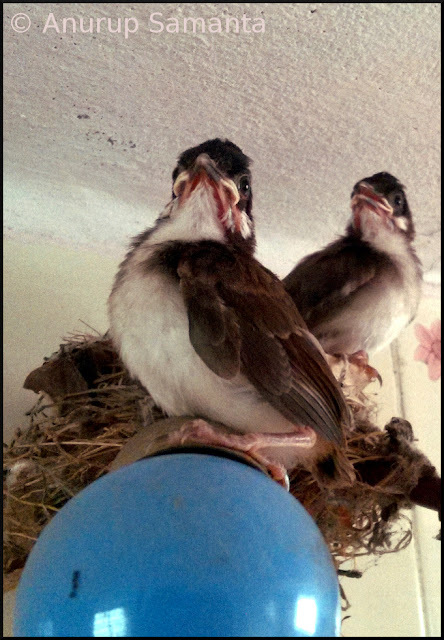 Bulbul siblings stepping out of their nest for the final flight! 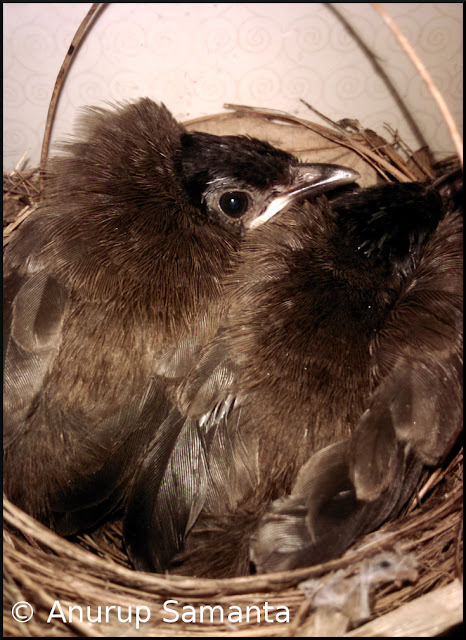 Excuse me for vaguely considering these bulbul chicks as 'male'. Let me clarify, this is not the result of any bias, but, because of the innocent fact that 'brothers' sounds better with bulbul than 'siblings' or 'sisters' (Yep buddy, otherwise I'm all good for gender equality, trans-genders included!). Would you believe me if I say these are those same baby bulbuls who were nothing more than a piece of fifty gram raw flesh each, just two weeks back? 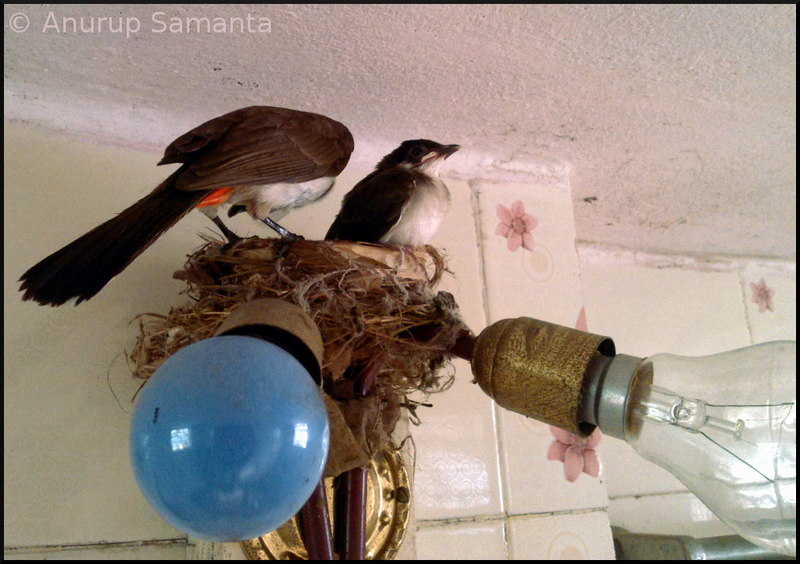 Well, this is the final photo story on my bulbul series and these photos were captured just before two bulbul brothers left their nest, abandoning my washroom forever (Click to read the First, Second, Third, Fourth, Fifth and Sixth photo post of this bulbul photo series). As I told you before of the growing aggression of the bulbul mother, I was praying for their rapid maturation so that my bathroom gets back its 'private' status once again. The final day was thoroughly eventful. 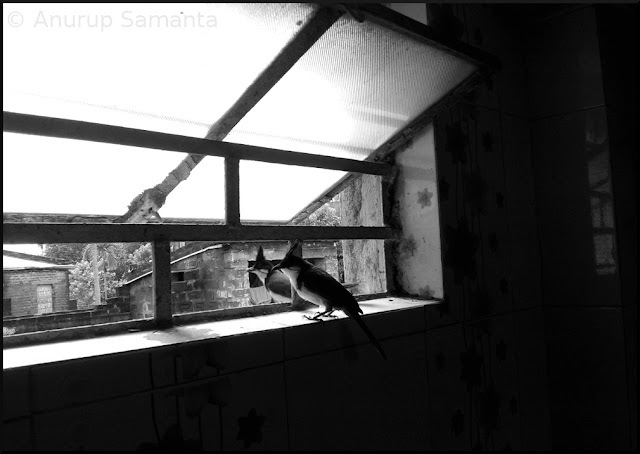 Bulbul chicks started hopping and gliding from one position of the tiny room to another, as a warm-up before the final flight. There is a papaya tree easily reachable from the bathroom window. As soon as one of these chicks reached a papaya branch, a hawk appeared from nowhere and grabbed the tiny bulbul. Oh what a circus it had been, and finally, two adult bulbuls could chase the hunter and rescue back their offspring. Thankfully the kid as unharmed. Here end all bulbul updates but I'll post a couple more selected photos from my bulbul archive in my next post... please check back soon. Lady bulbul is busy giving last-minute suggestions to one of her chicks before they finally left.